It’s always a good idea when looking at fundraising ideas to understand the time you will have to commit to fundraising and the fundraising profit you will get back from that time. Some fundraisers require very little effort or time, but give you very low profits. Other fundraisers offer higher profits but take too much time and effort. Halenda Pepperoni Fundraiser gives you the best of both worlds. A simple, easy fundraiser that you can finish in no time at all and get some of the highest fundraising profit available. Halenda’s Pepperoni Fundraising offers you 50% fundraising profits minimum. You start to double your money even if you only buy one case. We also have discounts that get you lower fundraising costs and highest fundraising profits. Halenda Pepperoni Fundraising program offers up to 56% fundraising profit on larger orders. Do We Have To Pay Up Front? This is one of the fundraising options you get with Halenda’s pepperoni fundraiser. About 95% of our fundraising customers want to have our Pepperoni Stix in their hands because when people see them… they sell themselves! You do less selling and finish fundraising faster. About 5% of our fundraising customers prefer to take fundraising orders using a personalized sell sheet and order form. They order only after they collect money. You choose the best fundraising option that’s right for your group. Halenda delivers your Pepperoni Stix anywhere in Ontario. Sometimes of the year are busier than others; but the average lead time is about 2 weeks for this popular fundraising product. There are two pick up locations in Mississauga and Oshawa. The best fundraising products have packages that help you communicate why you are fundraising and encourage them to buy from you. 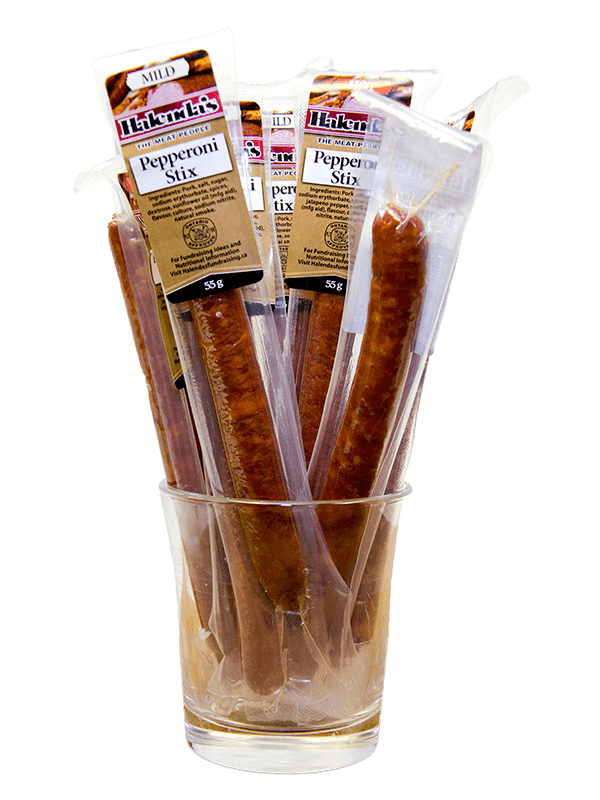 Halenda’s resealable fundraising bags are a versatile and functional package that lets people see our delicious fundraising pepperoni and allows them to either buy single pepperoni sticks from the bag or buy full bags. We put 15 individually wrapped and labeled fundraising pepperoni stix, (10 mild /5 hot) , in each fundraising bag. Having an assortment of flavours in each bag encourages people to make multiple purchases if they are buying single sticks from the bag. Our hot pepperoni stix offer a pleasant amount of heat that isn’t overpowering. Want To Learn More About Our Fundraising Program?